The good news about Asiana is that inflight drinks are still free, even in economy (or Travel Class), and there is a comprehensive selection of spirits too. The bad news is that service on Asiana can be somewhat robotic, to the stage where in economy there is just one drinks service before the food trolley arrives, and one after. You can get more drinks after this, but the crew will find it a little unusual, because it is out of their usual serving order. This robotic service is taken to an extreme in business class. Your drinks order is taken as your main course is order is written down, but woe betide you if you want to change drinks half way through the service, such as starting with cocktails, onto a bit of white, and then red with the (inevitable) beef, before port with the cheese and then a whisky. The crew like you to only have one drink type throughout the entire flight, and even one change will completely throw them out of kilter. Two or three changes, and their menu order sheet will become a mass of scribles. If you then ask for a Latte or Cappuccino, even though they are on the menu, you will get a deep sigh, and have to wait for a long time for your order. There is no separate wine list in business: instead, you have the wines listed on the first few pages of the menus. There are tasting notes for the wines in English and Korean. On the first page is a list of non-wine alcoholic bevereages, but it has a major flaw: it just says things like "beer", with no indication of which ones are available, or "Cocktails"... great, but without a clue what the crew can make, it's all rather pointless. this is a truly fine Sparkling Wine, which is much better than it was a few years ago. This is actually a blend of Pinot-Noir and Pinot-Meunier, with good maturity and aromas of ripe stone fruits, roasted nuts and fresh bread. 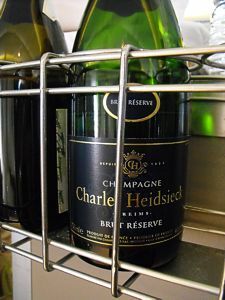 The palate is smooth and creamy with an elegant freshness and light mousse, very distinct witth fine fruit, some mineral character and a long clean finish. The Heidsieck is really recommended on a long day flight. You can quietly watch a few films, and have your glass permanently topped up. 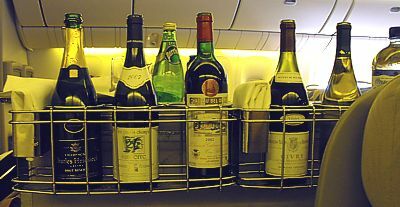 Beware though that only a dozen bottles are loaded on most long-haul flights, so if there are other people drinking this too, you may drink the bar dry of champers before the end of the flight. Sancerre is the epitome of the crisp Sauvignon Blanc. On the lightly undulating limestone hills the grapes enjoy a slow maturation and contribute with fresh zesty and herbal characteristics. This fine cuvee is a fine ambassador, with a nose of fresh grass, citrus, gooseberries and a crispy palate filled with green fruit, kiwi and a long crispy aftertaste. If you are used to the usual Kiwi Sauvi Blanc, it is well worth while seeking out this original from France. It's lighter than the New Zealand version, with a much more delicate flavour. There are few wines that can be as delicate and flavour intense yet as light and vivid as a German Riesling. This wine is a very nice example from the steep slate slopes of the Mosel Valley whose balance between sugar and acidity makes a great match to spicy food. The late harvested grapes contribute with aromas of exotic fruits such as mango, peaches, and minerals. The palate has a slight sweetness and a very clean fresh acidity that invigorates the palate. Lots of ripe fruit and a very long elegant aftertaste. The nose is very complex and displays flavours reminiscent of sweet elderberries, spicy blackcurrant and ripe plums. In addition the flavour is enhanced by a touch of mild spices, cedar wood and tobaccor, with slightly roasted overtones. This example is Pinor Noir at its best, from the gently undulating slopes of Givry. The wine has a good ripeness yet a classical freshness. The nose is very elegant and displays aromas of red citrus, wild berries and spices. Blended from whiskies matured for at least 18 years. Chocolate and orange notes, some citrus and spice on the nose and a full, fruity, citrusy and spicy palate, with sherry notes to finish. Produced by Chivas Brothers, at the Strathisla Distillery at Keith, Moray in Speyside, Scotland, this is carried in all Business Class cabins. Chivas Regal is one of the best selling premium whiskies in Asia Pacific, and this version is sourced in Korea. One slight warning: if you ask for a small glass of this stuff on Asian after the Port and coffee, you'll end up with a vast tumbler of it, full to the brim. This will either make the flight go very fast indeed, or put you straight to sleep, depending on your preference. Beefeater Gin contains nine different botanicals: juniper, angelica root, angelica seeds, coriander seeds, liquorice, almonds, orris root, seville oranges, and lemon peel. These botanicals are steeped for 24 hours prior to distillation. Distillation takes eight hours to complete. The distilled spirit is then taken to Scotland where it is blended and bottled. This isn't the best gin for an airline to carry, but it does the job. 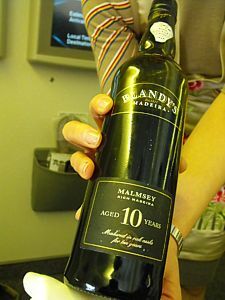 Blandy's Madeira is the best known fortified wine of Madeira. It's scent harmonizes with the flavours of chocolate, tangerine and vanilla and caresses the palate. Rich in apricot aroma, its elegant sweetness is best enjoyed with desserts or on its own after a meal. Personally, I like this one with Asiana's cheesecake. Specially selected Portos are chosen for agin in wooden casks which concentrates their fruit and flavour. It has a rich yet elegant combination flavour of dried apricots, honey, nuts and spices, creating an endless scent of the wine that unfolds and develops smoothly in the mouth. 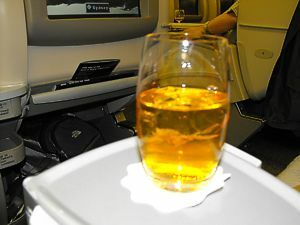 Beer is carried in all classes, and varies according to the origin of the flight. All beer is served in a 275ml tin. OB Lager is a pale, 4.4% A.B.V. pale lager available in cans and bottles, and served on draft in Korea. Originally brewed in 1948; the name was changed from OB Lager simply to OB in 2003 when InBev purchased the company; the recipe was altered to include rice. 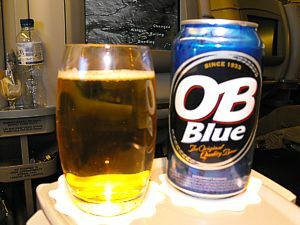 The name changed to OB Blue in June 2006 with another slight recipe tweak. Oriental Brewery or OB is a South Korean brewery established by the Doosan Group in 1952. It was purchased by InBev in 2003. Hite lager is golden in colour and is styled upon traditional European and American lagers. 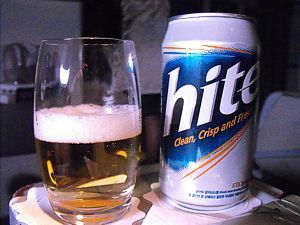 Along with OB and Cass, Hite is often found on draft in Korean bars and pubs. Most drinkers consider the draft versions of Hite, Oriental Brewery and Cass to be more or less interchangeable in taste and price. A pale-golden pale lager with an 4.5% ABV; one of the three best selling beers in South Korea. Originally brewed by the Cass Brewery, the brand had been taken over by Jinro-Coors, one of the country's leading brewers. 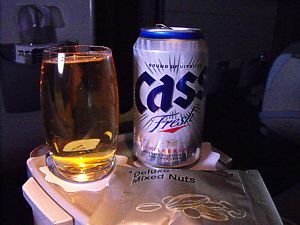 After having around 70% of the Korean lager market in the 1980's, by 1994 Cass had fallen behind Hite as Korea's top selling lager. Oriental Brewery bought the Cass brand from Jinro-Coors in 1999 and built it up again, with OB declaring a 51% market share in 2000. 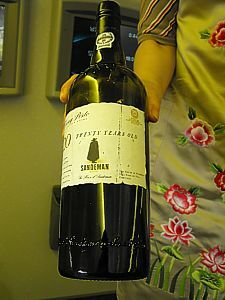 In 2007, the higher alcohol Cass Red was introduced. The famous Dutch export Heineken, made of purified water, malted barley, hops, and yeast. 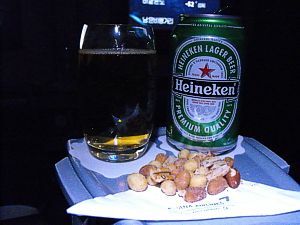 Its the usual tame stuff you get on the ground, with the Asiana version served on Frankfurt flights brewed in the Heineken brewery in Zoeterwoude in the Netherlands. 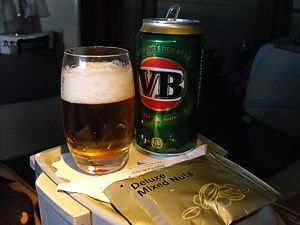 The Victoria Bitter is foul, with a terrible aftertaste, and should only be used as de-icing fluid. Pretty strong though. Yuk.